Check out the latest Eco Salon Goodie Box News on My Subscription Addiction! 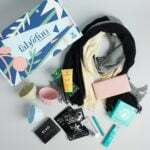 Eco Salon Winter Wonder Box Available Now! Eco Salon Glam Renewal Box On Sale at 11 AM ET! Eco Salon Glam Renewal Box On Sale Monday! Eco Salon Mind and Body Box On Sale Monday! Eco Salon Winter Natural Beauty Box On Sale Monday!